I am so excited to be able to share these pages with you! I was able to give this album to my parents yesterday. 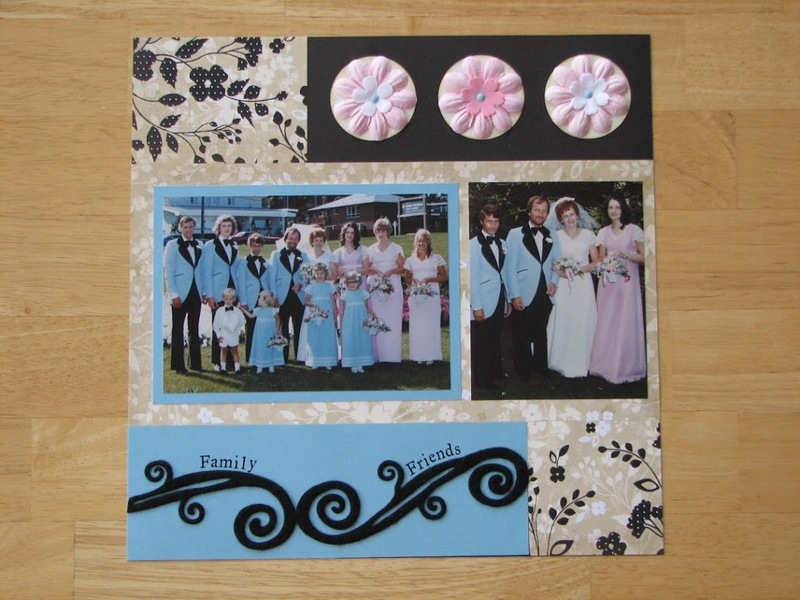 I thought I would have a few more weeks, that our family wasn’t going to be all together for a while and then my mom called me up on Saturday afternoon asking if we could come to Peterborough for dinner out on Sunday without the grandkids. Well, of course, I said yes! Then it was a mad dash to get the photos printed, since I’d only used quick print-offs to create the pages, and a trip to Michaels to buy an album, since I didn’t have one yet, and then working like crazy Sunday afternoon to get it all put together. This all happening after a double workshop weekend, both Friday and Saturday evening. Phew! I was exhausted by the time we got home last night. But all that craziness was completely worth it. Mom and Dad loved it. And there’s still more pages to be done with their childhood and family photos. I didn’t want to wait until it was all done to post, so here’s the ones I gave them yesterday. Just click on the photos if you want to see them larger. 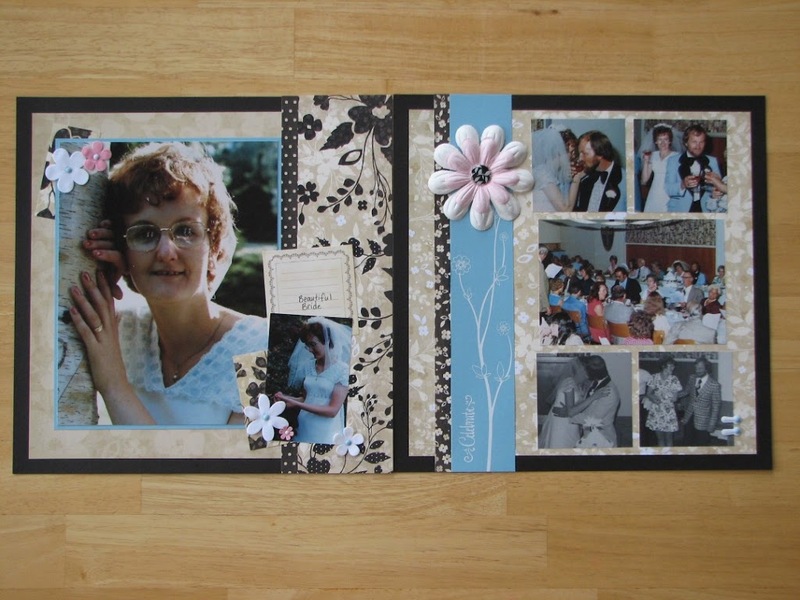 I went to our How-To books (Cherish, Imagine and Reflections) to do most of these layouts. I used PageMaps for one of them. 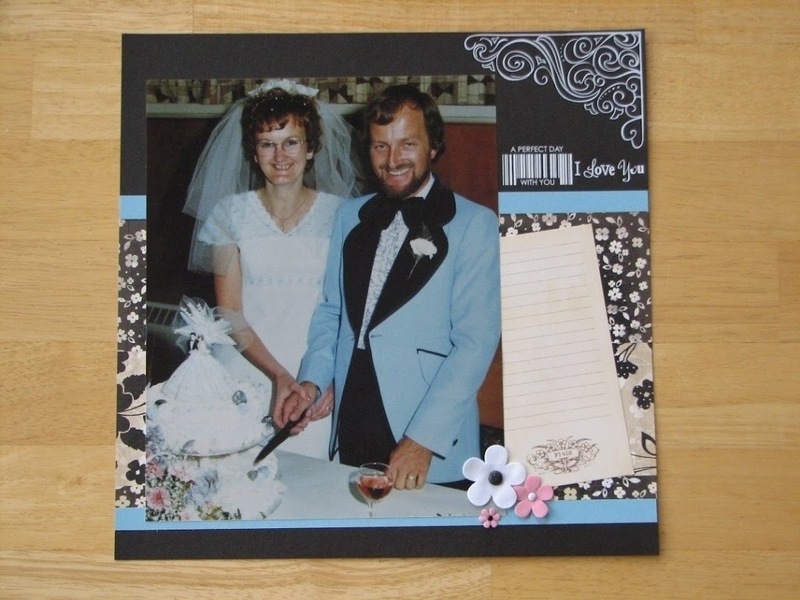 CTMH’s Sihouette Level 2 paper pack was perfect, especially when I was able to match Crystal Blue cardstock to the men’s tuxedos. I also had fun using all our fabulous rub-ons. They look great against the black, white, and blue. 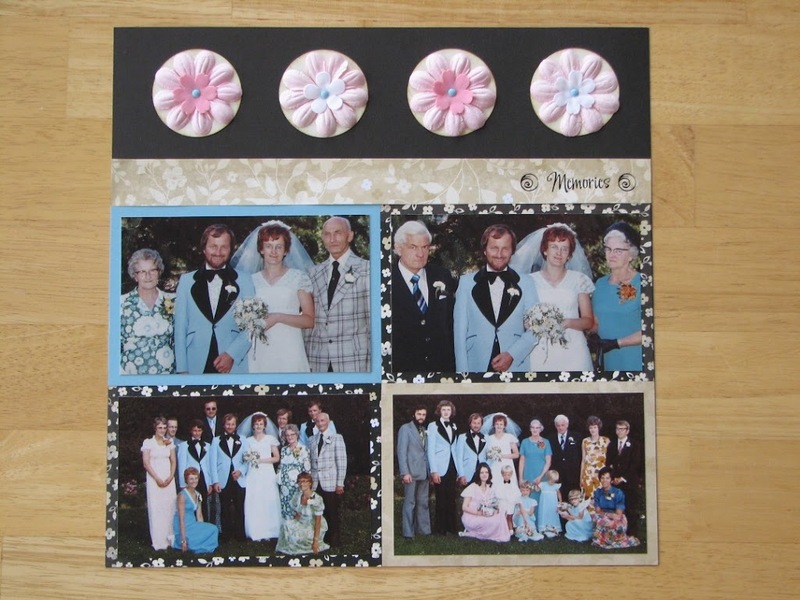 Most of the flowers and brads are from CMTH’s Big Pinks, but there are some embellishments from other companies. I’m afraid I don’t remember where. 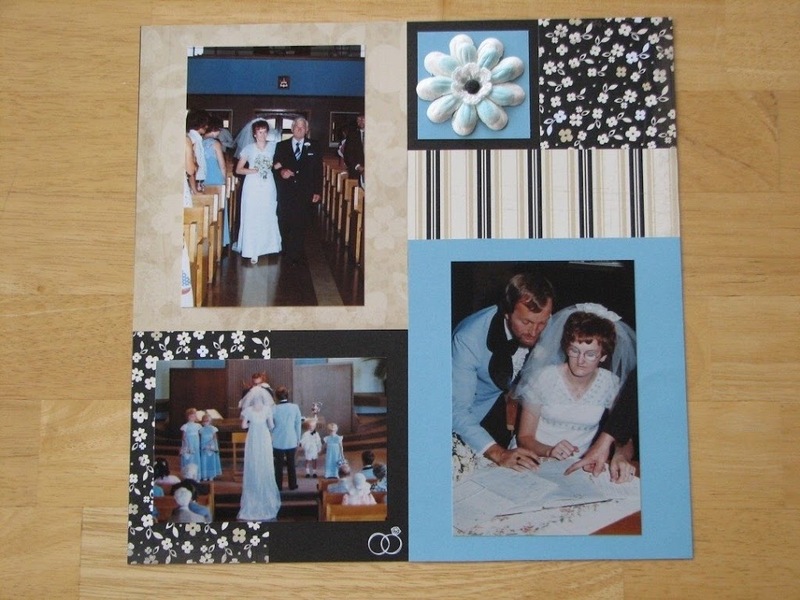 I should say also that most of these photos are from my parents’ original wedding album. They were all 8×10, except the black and white ones. I simply took photographs of all the photos and then I could print them out in the sizes I wanted. The black and white photos were from an album of extra photos they had. All of them were faded and brown so when I took the photos I turned them black and white. I think they look much better now. 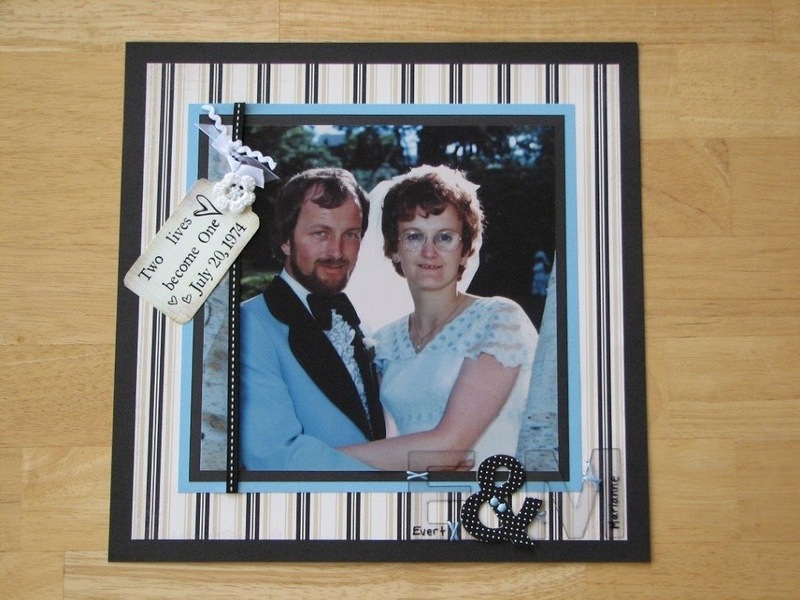 I’m looking forward to creating pages with photos they’ve just had in a box. I’ll be using clear photo corners so the photos can be removed to make copies of them if that’s ever needed. Stay tuned. I’ll be posting them as soon as I have them done! Awesome album Krista!! 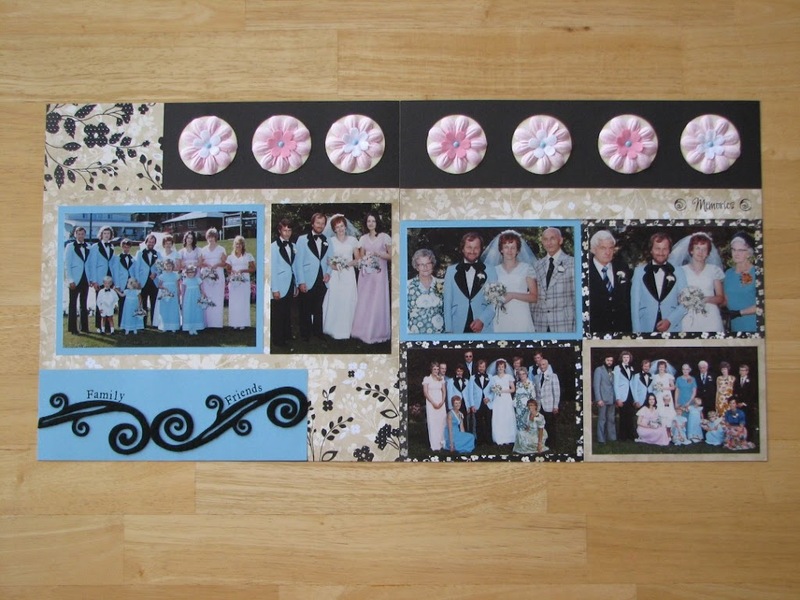 I hope to do something like this for my parents as well – you’ve given me lots of ideas! Wow what a gorgeous gift!!! Those papers are soooo perfect for this!! WOW This is great..no wonder they loved it. 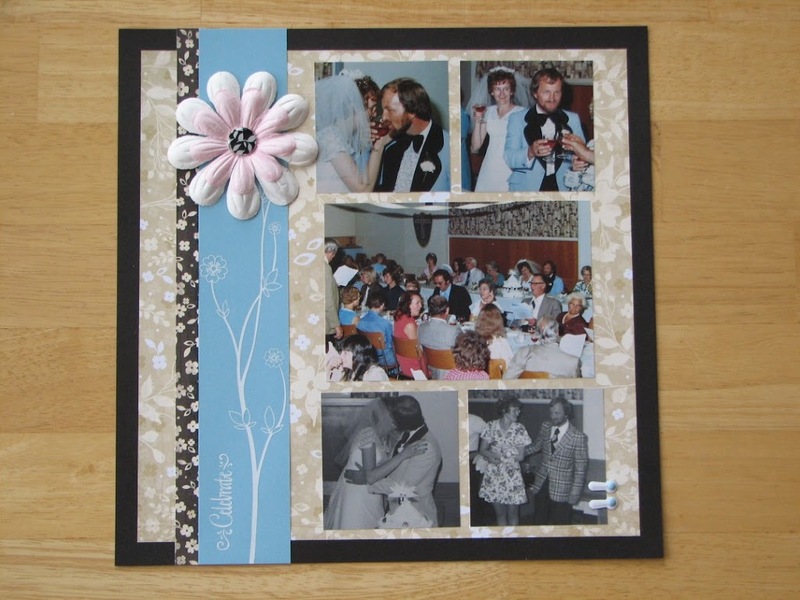 The crystal blue works so well with the papers and the Tux! What a great idea to take pictures of the pictures to make them the size you want! Awesome. Awesome job Krista! I would love to have a copy of the picture of our family. 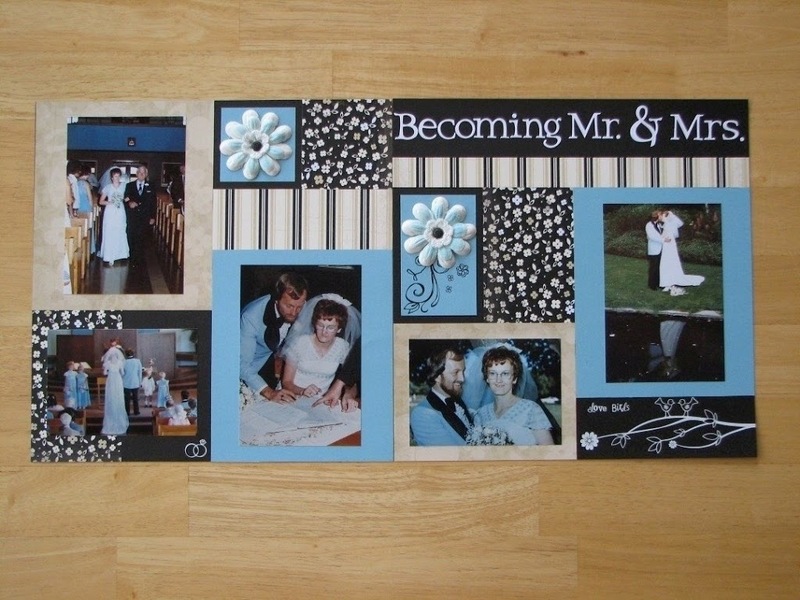 I love how you used blue with the Silhouette papers!